This is a guest post written by Shane Rice. Shane is a church planting missionary transitioning from Peru to Italy. Accordance is a Bible program that you install and use on your computer. There are two or three primary ways of doing things. Some people like to study the physical books that they hold in their hands. Others use the Internet to study the Bible, generally depending on favorite web sites that host Bibles, commentaries and dictionaries on their web site and allow the use of them. And then there are those who install a Bible program on their computer or tablet and use it when not connected to the Internet. We will be reviewing a single program that is installed on the computer and used to study the Word of God. With that being said, let’s roll up our sleeves and get into the specifics of this program. First and foremost, what does Accordance Bible Software run on? It was originally developed for Mac computers, which perhaps is opposite of many programs. They later developed a version for Windows computers. This review is written by a Mac user, and therefore will be given from that point of view. They show Accordance being used on Windows computers in some of their video podcast episodes. It seems to run equally well on Windows systems. When you buy the software, it can be used on either platform. You don’t buy a Windows version, and then have to invest in a Mac version later, or vice versa. As a bonus, you can buy it and actually use it on more than one operating system. It is a single user’s license, however it can be used for example on a Windows computer at work, and then on a Mac at home by the user it is licensed to. Accordance is currently offered only for iOS. There have been a few discussions on the forums about Android, but mostly they are requests. Nothing formally has been started in this direction, however it may come in the future. Their iOS app is top notch. It, of course, doesn’t offer all the power that a desktop offers, however it does have the ability to sync between the desktop and iOS device. It offers syncing with either Dropbox, or straight from their program to the hand-held device on the same network. Both ways of syncing work equally well. Comparatively Dropbox can be a little slower, but both work great. It has the ability to sync the user’s notes as well as user materials. When syncing directly with Accordance, the resources the user owns (dictionaries, commentaries etc.) can be directly added to the iOS device, making it much faster than downloading them from the web. Wow! That is all I can say about the speed of the search and verse lookup. You can see lightning strike, but a normal person cannot time lightning striking. That is the ability of the search of the Bible apps in Accordance. While searching all materials—well, it would depend on the size of the library—however, it isn’t as quick. It is still fast though. There are many variables that can be set in the searching options. The speed to search the entire library can depend on the options that are set there. It has a normal to good startup speed. This can be optimized. I heard one user say they shut off the startup screen to get a quicker startup speed. It is very reasonable startup time on my Mac compared to many of the other apps that I use, and faster than the other Bible programs that I have. Search their store to see everything they have to offer. There is a lot of material that I already had with other Bible programs, however what they have done to them is quite impressive. They are searchable by Scripture reference, English content, as well as titles. I have also come to realize over the years, that sometimes you may think that you have a book or a commentary in a program, but you may actually have a watered down, lightened version. A few times in the past I was looking in a physical book and saw stuff that was missing in the electronic version in other programs. Of course that isn’t advertised, but it happens. This doesn’t seem to be the case for the materials offered in Accordance. If you are looking for a specific title, search their web site, and see if it is there. If it isn’t there, check on the forums to see if anyone has requested the title. Perhaps it is already being worked on. However much of the material that they have is a good addition to anyone’s library. Their graphics suite is incredible. It is more than just looking at maps and timelines. The user can search for a person in the timeline, click on their name to bring up information on that person in their dictionaries. They can then change what time periods can be viewed, as well as kingdoms. Their maps are similar. You can overlay lots of extra data on top of the maps to see where kingdoms stretched too. They also have routes programmed into the maps—which you can see demonstrated in the video below. You can view the long trek that Abraham took when he left Ur. You can watch the route of Mary and Joseph as they head to Bethlehem, and then flee for Egypt. I was quite impressed with the maps and their ability to see the journeys and even the terrain elevation. While the price may seem high, the old saying rings true! You get what you pay for. I have probably used about every ‘free’ Bible program under the sun. I will not weary you by naming them all here. Suffice it to say, I have probably used Bible programs that many have never even heard of. In all of the Bible programs that I have used, I have never used a Bible program that was integrated as well as this program is. Without a doubt, the Accordance Bible program takes the cake. It is one of the most comprehensive programs I have ever used. So, yes it does have an up-front cost, but again, you get what you pay for. If you are serious about studying the Word of God, this program is for you. If you have any doubt, or are concerned about laying out that much money, watch their free training videos to really see what can be accomplished with this program. That is probably the best thing that you can do to really understand the usefulness of this program. Having viewed the first three, I can testify they are extremely helpful and informative, and may help you make an informed decision. They offer a limited trial as well, though it has limited resources to work with. They also offer different collections of materials all put together. Again, you can mix and match different titles or even different bundles to get exactly what you want. This can be a great way to get started, and build a library little by little. I took an entire commentary set that is being offered, and divided that cost per book that is in the set. It came out to $7 a book (without any discounts). I quickly checked on Amazon, and couldn’t find the same book at that price. That book was running about $10-25 for the same title (before shipping charges). I have also priced their resources with other programs, and they have consistently come out with very competitive prices for their titles. With the price being what it is, it is always good news to find out about discounts. They offer a variety of discounts for full-time ministers, home-schoolers, students, as well as over seas missionaries, and others! So do yourself a favor and see if you qualify for any discounts. It always helps. Learning a new program can be a daunting task. Their self-help material is great. Everything from their training videos to the help file in their program. One is not in the dark stumbling around trying to figure out how to use this program. This program is really not that difficult to pickup and start learning. I do recommend their training videos to really become efficient at using their program to its full potential. If you have trouble understanding something, their forums are very helpful as well. I have had a few opportunities to use their support. There was a faulty download with my install (my poor Internet connection kept disconnecting during the download). They were quick, friendly, and diagnosed the problem promptly. After a few moments I was back on track re-downloading the material that was incomplete before. Also on the forums they have always been helpful. I thought I found a bug, however it turned out that I didn’t understand how something worked. Again, everything was straightened out, and I was back on track. Help has always been prompt and friendly. Recently, as a missionary changing from one field to another, I have had to get rid of a lot of books from my library. It was painful and very difficult process to decide what books to get rid of. I had imported books into the country for 11 years and one trip out would not allow me to take them all home. Many were books in English which would not help anyone but other English-speaking missionaries. It was then I decided I must replace my heavy library full of paper books with electronic texts that do not weigh extra. That is what prompted my search for a good Bible program with a good set of library materials available to me. I hope that you have benefited from my research and that I could be a blessing to you. I have used free Bible programs on the desktop, Android, and iOS, and yes to even date myself, I date back to the Palm OS platform. I cannot even count, much less remember the names of all the Bible programs that I have used throughout the years. As a missionary, I often find myself in the need of foreign Bible versions in a program. I have even become proficient at importing my Bible texts into many different Bible programs that give you the option to do so. With that experience, I found that I could import a Bible text into Accordance within about 3 days of having the program. That being said, I was pleased with their simple interface to import a text. While probably most people aren’t going to go importing a Bible text right off the bat, I simply bring it up to say that it can be done, and is a nice feature they have included in their program. It is a great program. I have refrained from comparing this program to other Bible programs for a few reasons. It is in a class of its own. It is certainly a top-notch program from a technical standpoint. From a preacher’s standpoint, it is an excellent program. I was completely impressed with its interlinear ability to highlight all keywords across several different Bible texts that are tagged with the Strong’s numbers. Its search feature is impressive, flexible and dynamic. The material it offers is very complete with more to be acquired with time and money. 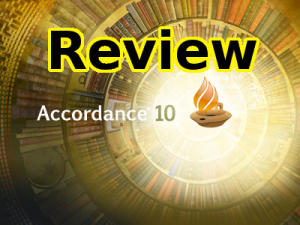 Lastly, I have heard it mentioned a few times, Accordance keeps the Bible at the center of your studies. I was shocked to try another major Bible program and find that was not the case. Personally, I prefer the Bible to be the center of my study. I prefer to read and study the text of the Word of God, and base my studies off what is found and written therein. I study themes and I look at other material, but the Bible is always the center of my study. If that is what you are looking for, then Accordance is what you need to get the job done. I’m by no means an expert on Accordance; but from what I have learned, it has been a great blessing. I look forward to many hours of productive study with Accordance. Shane Rice is a church-planting missionary serving in Italy after working in Peru for 11 years. God has blessed Shane and his wife with 6 children. Besides being a missionary, Shane shares a love for technology and is always looking for ways to make ministry more streamlined by using tech tools.